Comfort Fiebing’s Compression Socks have been designed for the ultimate in user comfort. The compression design naturally eliminates the problem of socks sagging down or bunching up in boots. The socks can be worn all day and they will stay put. In addition, the seamless construction eliminates friction “hot spots” that can cause blisters and skin breakdown. Science Compression technology originated in the medical field as a way to increase blood flow for patients that suffered from a variety of conditions that can cause poor circulation. Over the last few years considerable research has been performed that shows how adapting this technology to everyday life, work and athletics can have a profound increase in energy levels and quality of life. The primary function of veins is to remove deoxygenated blood back to the heart. Because this function goes against the force of gravity, vein valves must properly function to prevent the pooling of blood in the legs. Swelling as a result of exercise, hard work, or even extended periods of inactivity (often experienced during travel) can cause blood vessels to lose their shape and not function properly. 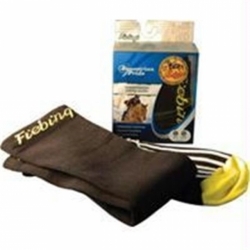 Fiebing’s Compression Socks apply pressure to the tissue, muscles, and vein walls to restore the proper shape which allow the vein valves to shut off properly, thus restoring normal blood flow. Proper blood flow results in fresh oxygenated blood to the muscles, joints, & tendons and this is the fuel that energizes the body.